There is a $25 entrance fee for Yellowstone if you do not have an annual pass. 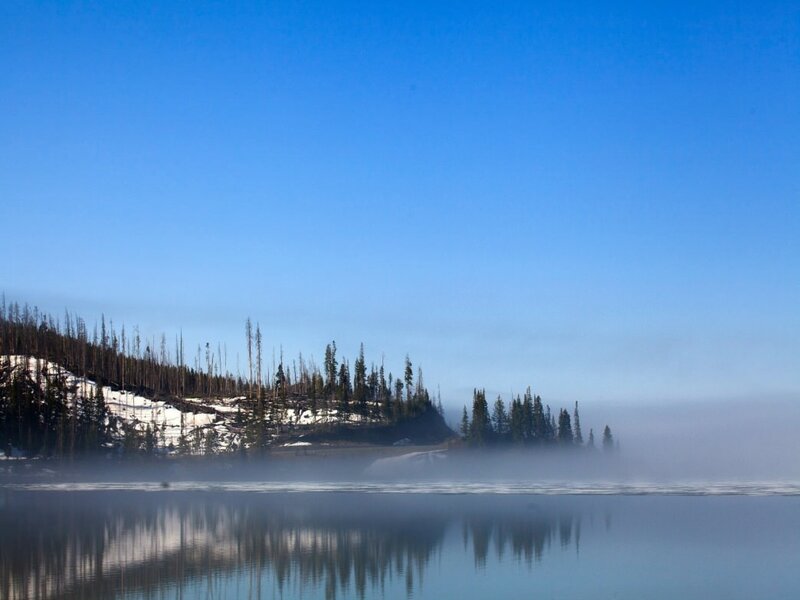 Sitting smack dab in the center of Yellowstone National Park, Yellowstone Lake covers 136 square miles with over 110 miles of shore line. Mornings and evenings make for the best boating when the winds are calm. Mid-June to the end of September are the best months for paddling about on this expansive body of water. Lake Yellowstone is big water that acts more like a small sea than a lake. Experienced boaters will enjoy time on the water, but this is not the spot for beginners. 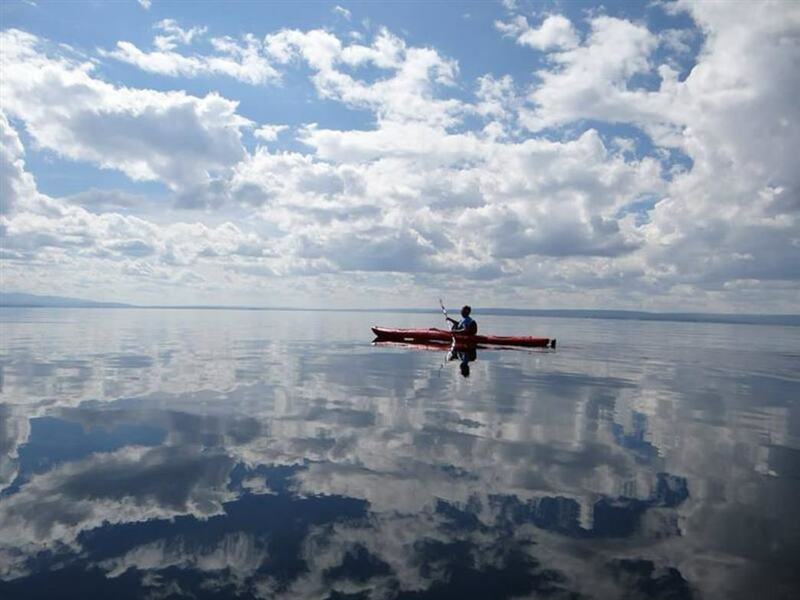 Yellowstone Lake is more suited to kayaking than a stand up paddleboard, but if you've got the expertise you can make it work. Any boating on Yellowstone Lake is tricky - the water is always cold (very cold!) and heavy winds can sweep from the west creating 6' waves on the eastern shore. You can quickly find yourself in some serious trouble. Everything in Yellowstone is awesome and the lake is no exception. Massive and beautiful, you can spend a day or weeks boating and camping in near utter isolation. You'll have an experience that very few other visitors to the park get to enjoy. Certain parts of the lake make for better boating than others. The eastern shore tends to be a tad inhospitable for landing any craft. The banks are high and unless the lake is completely calm, you'll have high waves to contend with. From Cody, Sedge Bay is the closest area for either kayaks or SUPs. The beach here is gravel and you can put in all along the bay. You can head south to the 9 Mile Trailhead and beyond to Cub or Trapper Creek. This is about a 4-5 hour jaunt. Sea worthy craft are requisite in this part of the lake. Be cautious when rounding Steamboat Point when it's windy. It can be sketchy here with waves that'll seek to toss you up onto the rocks. Also know that you might be negotiating a surf zone when returning to Sedge Bay. Another good spot with generally calmer water is Gull Point. This little drive off the Grand Loop Road is located right after the bridge at Bridge Bay and has a gentle put in site. While paddling around you’ll get stunning views of the southern Absaroka Mountains and the Lake Hotel. Intermediate and advanced boaters with adventurous spirits will enjoy getting out onto Lake Yellowstone. This is a great place to make longer tours - anywhere from all day to multi-day excursions. Paddling the inlets and bays of the lake is the best way to see much of Yellowstone's wildlife including Bald Eagles, Osprey, river otters, elk, moose and even grizzly bears. Several thermal features hide just offshore and can only be seen by boat. From Cody, take US HWY 14/16/20 west 52 miles to Yellowstone’s East Entrance. Continue over Sylvan Pass and stop at the Lake Butte overlook on the far side of the pass. The overlook gives you a good orientation to the park and offers a nearly complete view of the lake itself. From the overlook return to the main road and continue west to Sedge Bay. There’s a large undeveloped parking area on the left as well as a vault toilet and picnic tables. You might even get to watch a grazing bison to two. Just make sure to leave them alone. More people are injured each year by bison than any other animal in the park. To get to Gull Point Drive from Sedge Bay, continue west about 5 miles to Fishing Bridge. At the four-way intersection turn left. Continue south to Bridge Bay and turn left immediately after the bridge over the inlet to the marina. This is Gull Point Drive. Park along the shore at the first sharp right turn. There is a $25 entrance fee for Yellowstone if you do not have an annual pass. Your entrance permit is good for one week and also allows you to enter Grand Teton National Park. You will need a Yellowstone boating permit, and if you’re planning on an overnight trip, a backcountry permit as well. Boat and backcountry permits are obtainable at the Bridge Bay Ranger Station. In addition, you’ll need a NPS aquatic sticker. If you plan to fish from your boat, you will need a Yellowstone National Park fishing license, but you won’t need a Wyoming state license. Also, be familiar with all fishing rules and regulations. Dogs are not permitted in the backcountry, are only allowed in parking areas or campgrounds and must be leashed at all times.